Looking for Some Local Supporters! Being born and raised in New England, I have a great appreciation for this area of the country. Although its a love/hate relationship, many of us realize at one time or another how much New England has to offer. We all have traveled to other parts of the country and realized we have some of the best mountain biking terrain, parks, mountains, and trail systems. I have been riding all my life and just recently it has become somewhat of an obsession. From dropping over $2500.00 for a new rig, blowing off work to head up to Highland Mountain, building stunts in my backyard or ripping the local single track after work. At some point we all realize how much work goes into this sport. So this is why I’m posting here. Since I have an addiction of wearing logoed t-shirts, I decided to create a t-shirt that represents what the New England rider is and what it stands for. 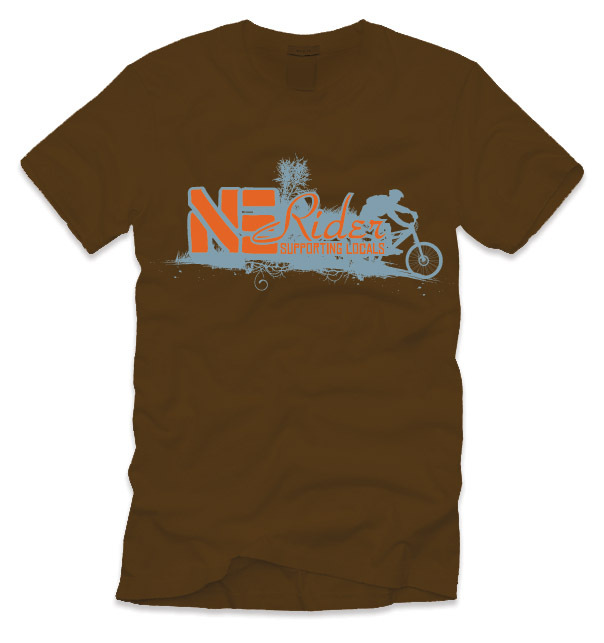 The "NE Rider" is an idea I came up with to help with the associated costs that organizations accrue while trying to keep our sport fresh for all of us to enjoy in the NE area. This is not a Romainian credit card skimming scam or a Nigerian million dollar inheritance fraud, it's a legit idea to help all of us riders in New England better the places we ride. We don't want to ever loose them. Here's the pitch....with every sale of a shirt, we will set aside $5.00 in a "cookie jar". When that fund is large enough (a number yet to be determined) we will donate these funds to a organization (NEMBA, HIGHLAND, DESIELBIKES, KINGDOM TRAILS) to name a few. There are some specifics to work out, but that’s the plan. We will be contacting everyone with full details as this moves forward. Its pretty simple, open your wallet, grab a $20.00 spot, help a local venue and sport your fresh looking shirt proudly. As an introductory price, we are offering the first 20 shirts at a discounted price of $17.00 + $3.00 S/H. We are using PayPal for quick, secure purchasing. Sizing is standard S, M, L, XL, XXL (if you need a BIG BOY let me know) Shipping will be $3.00 dollars. So for $20.00 you help a good cause and get a fresh shirt o your door step.